Some who have worked with me think I am a really good services developer because I know a lot about SOAP-based Web Services, ASP.NET, WCF, and .NET. Others think I am a web developer because I know how to build web applications using REST-based Web Services, AngularJS, jQuery, and HTML. Even more think I am a cloud developer because I know a lot about Amazon Web Services and Microsoft Azure. A few think I am a HPC (high performance computing) developer because I am an expert at using Digipede and Windows HPC Server. Friends of mine think I am a mobile developer because I write mobile apps for iOS, Android, and Windows Phone using Visual Studio, Xamarin, and XCode. And yet even others think I am a database developer because I know something about ADO.NET, Entity Framework, SQL Server/SQL Azure, PostgreSql, and more. The reality is that I don’t constrain myself to one technology, platform, or stack. I am what they call a full stack developer and architect. However, one thing that many people don’t know about me is that I am a SQL Server Certified Master. Yes, you heard me, a SQL Server Certified Master. No, I am not a DBA. I could certainly do the work of a DBA, but that is not me. 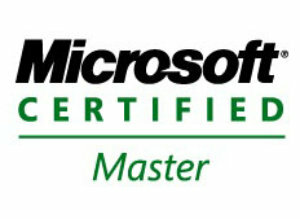 It takes a lot of effort to become a certified master in any of the Microsoft products. I had to put in 840 hours, 5 weeks straight, nights and weekends studying, taking tests, performing lab exercises, and more to achieve this status. Even then, if I didn’t have the culmination of my years of experience developing applications on SQL Server I would have not passed. For SQL Server, there are only a few hundred MCMs in the world. I feel very privileged to be a part of an elite few. Unfortunately not many know that I am a SQL MCM. Of course if you are reading this blog post, you certainly will know now. So why this blog post? Just this week a good friend of mine who I have known for about 8 years texted me and then pinged me on Skype. Something must have been urgent. He said, “Do you know anyone that can help with a database?” Of course I laughed when he asked me this question. I said, “Which database?” He said, “SQL Server”. Of course I laughed some more. I immediately informed him of my status as a SQL MCM to which he said, “Jeez, you do everyone.” What was interesting is that his need for a database person was something simple that was causing them great stress. It literally took me less than 30 seconds to understand the problem and tell them how to fix it. It was the familiar problem where the SQL Server user accounts in a restored database do not match the SQL Server logins on the server. A quick reference to sp_change_users_login (Transact-SQL) solved that problem. Any good SQL Server DBA would have been able to fix this in a similar amount of time. This “Help! I need a database guy” made me realize that I needed to do a little more advertising of my capabilities, especially around SQL Server, since a friend of mine who has known me for 8 years didn’t know that I knew a great deal about databases or that I was a SQL MCM. Now you know the reason for this post.